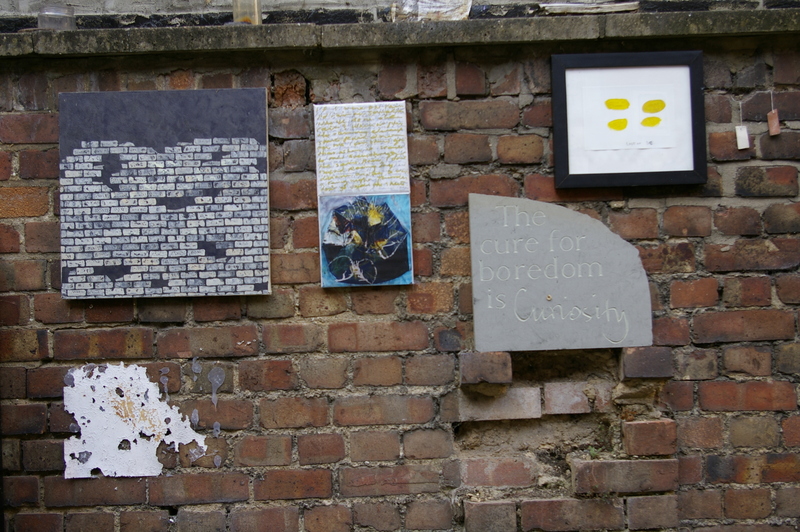 When the awards are handed out for services to abstraction, Lisa Denyer and Matthew Macaulay should get big shiny ones for continuing to bring interesting contemporary abstract paintings to engaging city centre venues outside of London. At Form/Function they bring together work from ten artists in a difficult space, an unoccupied office block at Piccadilly Place, Manchester, that works many times more than perhaps it should do, and the sense of it working, against all the odds, increases as I pay attention to each piece. Perhaps it’s the fact that the artists were asked to respond to the space, and its subverted functionality, that makes the show so successful. Karl Bielik, Arrow, oil on canvas. Image by courtesy of Lisa Denyer and the artist. The rich greys in Karl Bielik‘s “Arrow” seem to echo the greys of the walls, without blending into them, and there is enough natural light to see the subtle rhythms in the image as spatial passages between roughly painted figures opens up. A luminous yellow/green area underneath a layer of grey shines through to the surface. Above it a white painted area has a hardness about it and the spaces within it start to resemble the kind of space you get in a rock or mountain formation. It’s just enough to evoke landscape without attempting to represent a landscape, in the same way that a poem or a song might evoke an experience without actually describing it. Then the shapes seem more to connote a stage, the kind that children might make from furniture draped with a white sheet. That a grey/brown shape towards the right hand edge could be read as having an edge like the edge of a sheet of paper adds to my “home made stage” fantasy. But studying the rest of the painting ultimately denies these associations and I become aware of my active participation as an interpreter, that what I “observe” turns out to be a projection. And this engagement of my own epistemological processes is, for me, one of the attractions of abstract art. 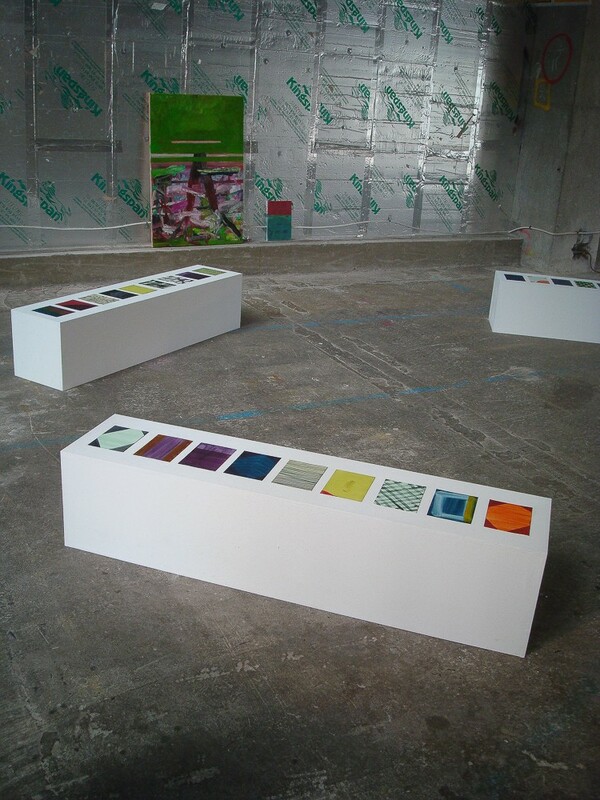 Installation shot showing Terry Greene, ‘The world is a handkerchief’ and ‘Mi casa, su casa’. Image by courtesy of Lisa Denyer. 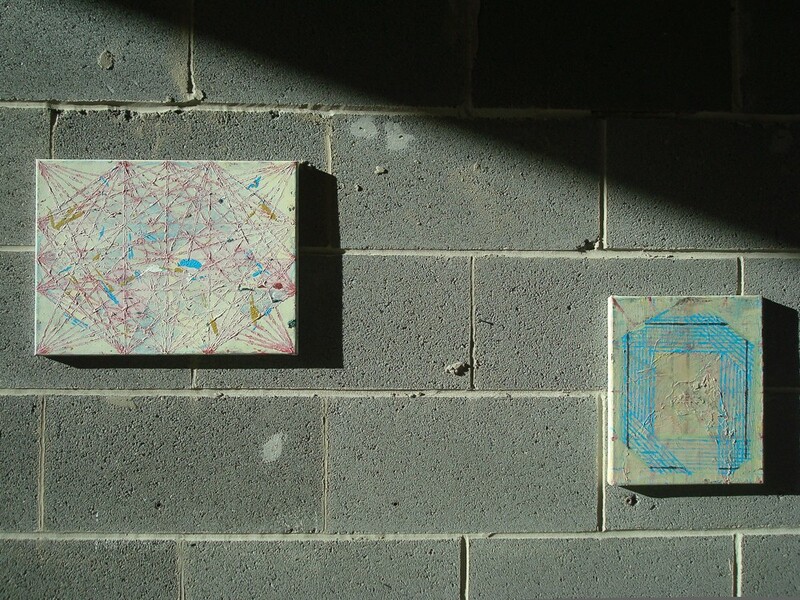 The two paintings by Terry Greene feature painted lines on canvas, with accompanying events. 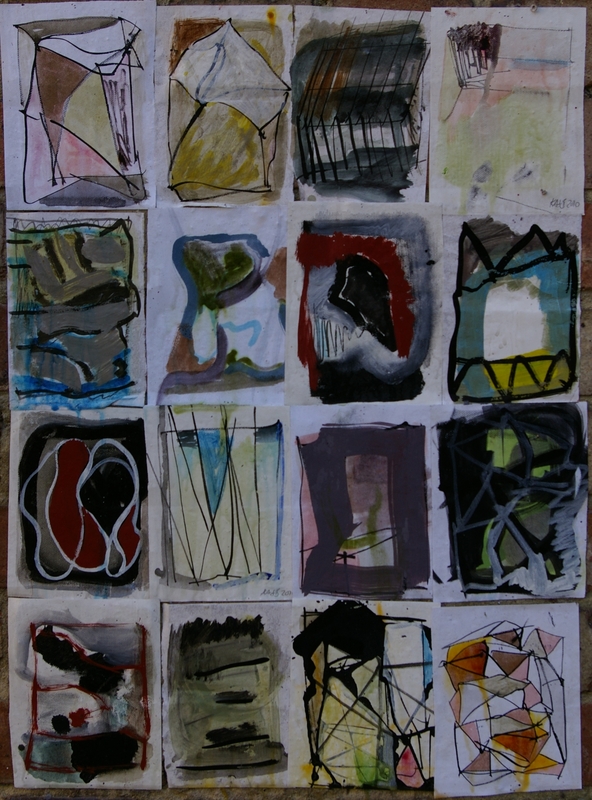 They are nearer to ‘geometrical’ than other paintings of his I have seen, whilst in continuation with other of his work, he employs a method of making multiple iterations, arriving at a final form as if by thinking aloud, previous versions, becoming a part, even if as shadows, of the completed whole. Paintings by Brendan Lancaster appear almost to grow out of the wall, mortar and other markings in the environment could be tracks or drips of paint from one of Lancaster’s canvases. However, the pictorial space in the paintings contrasts with the flatness of the grey breeze blocks. In Snag, a portal almost gives view of a world beyond the canvas but also continually brings my eye back to the painting’s surface. Long brush strokes produce curving bands, recalling a morbius strip, tracing a route that creates a shallow cubist space at the right hand edge, but leads into something approaching illusionistic three dimensions just above the centre. My attempts to make sense of what might be “out there” are frustrated by the reappearance of the wall-like surface toward the left hand side. There are wonderful little paintings on paper here by Rachael Macarthur, one posted to a concrete pillar functions as a marker, alerting me to the possibility that the pillar could itself be a painting of sorts, having circles inscribed into its surface along with an accidental smear of paint. I suspect that it is the minimalism (I mean it in an informal sense) of the art work that leads me to notice what’s around it, and to include it in my experience of looking at the art. However, it is also the art works difference to the environment that becomes heightened. The stark utility of the surroundings contrasts with the uncertain functionality of the paintings. 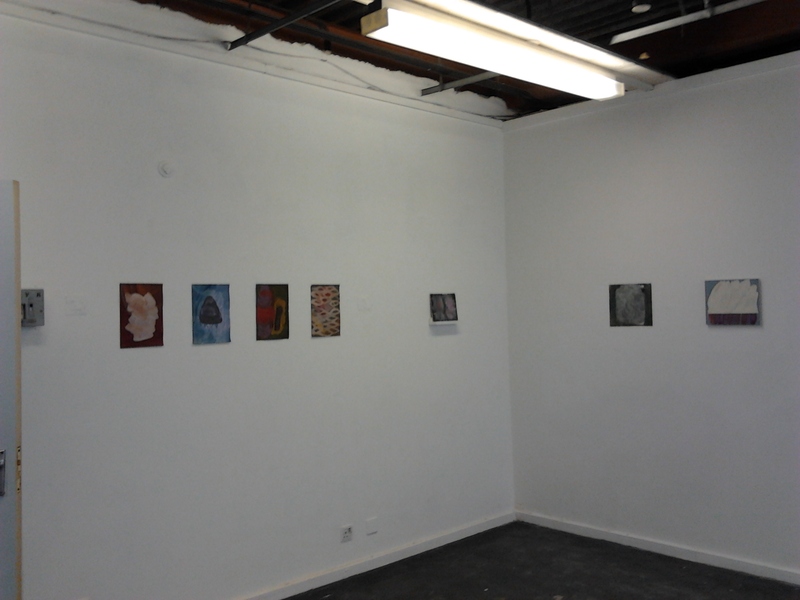 Installation shot: Rachael Macarthur painting on paper on pillar in foreground with Brendan Lancaster and Terry Greene paintings on wall behind. Image by courtesy of Lisa Denyer. 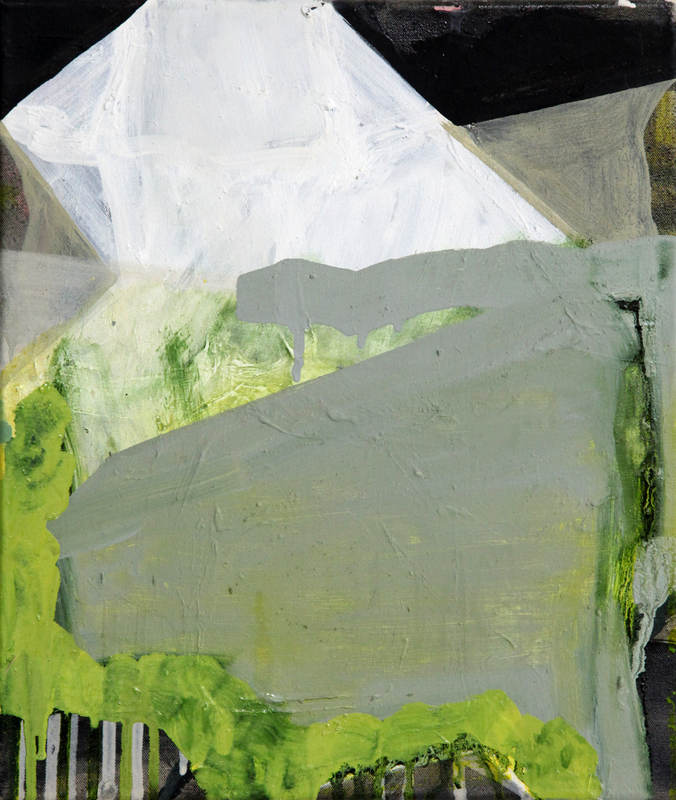 Sarah McNulty‘s paintings share with the others here an interest in minimal form as well as an experimental approach to image making. 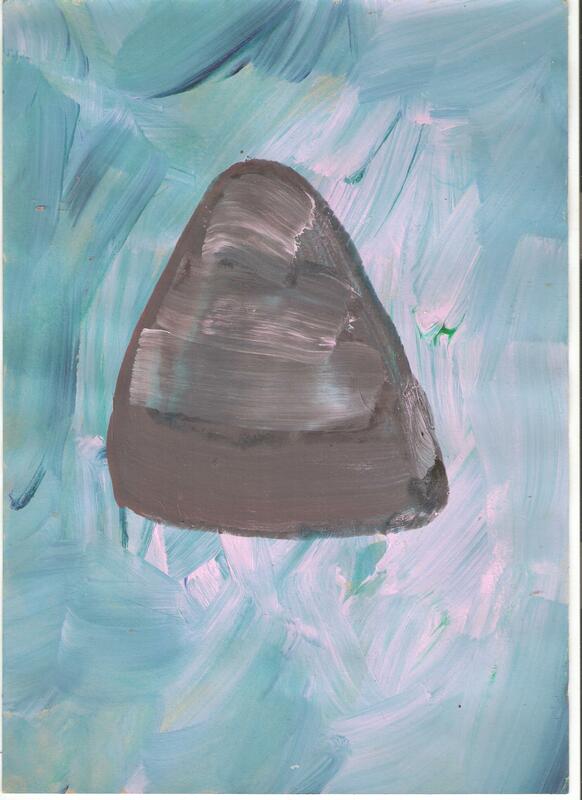 I get the feeling that her paintings invent themselves under the general tutelage of the artist. 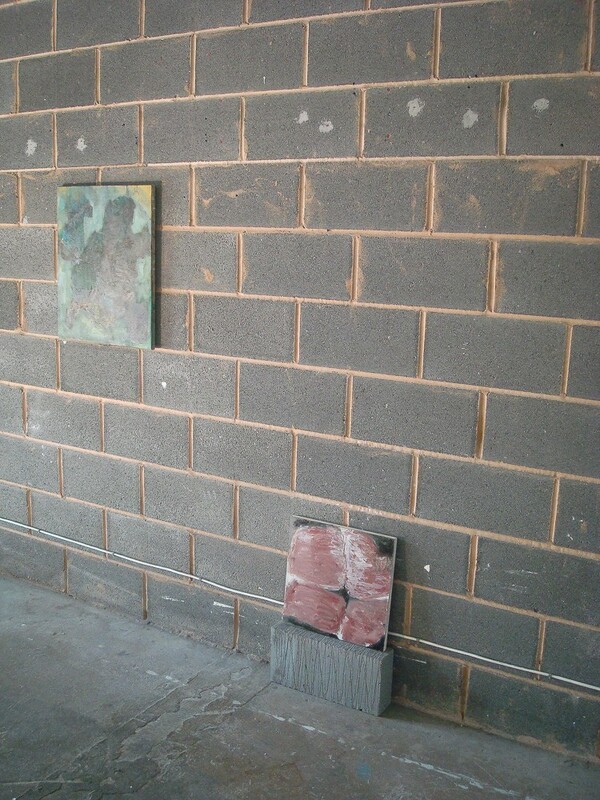 I wonder if the choice to place the painting ‘Foil’ on a concrete brick was influenced by the Plane Space exhibition at Worcester Cathedral in 2012, where one of her paintings was similarly situated. Having seen that show I cannot help but make the connection, and to note both similarities and huge differences in the type of space being inhabited. 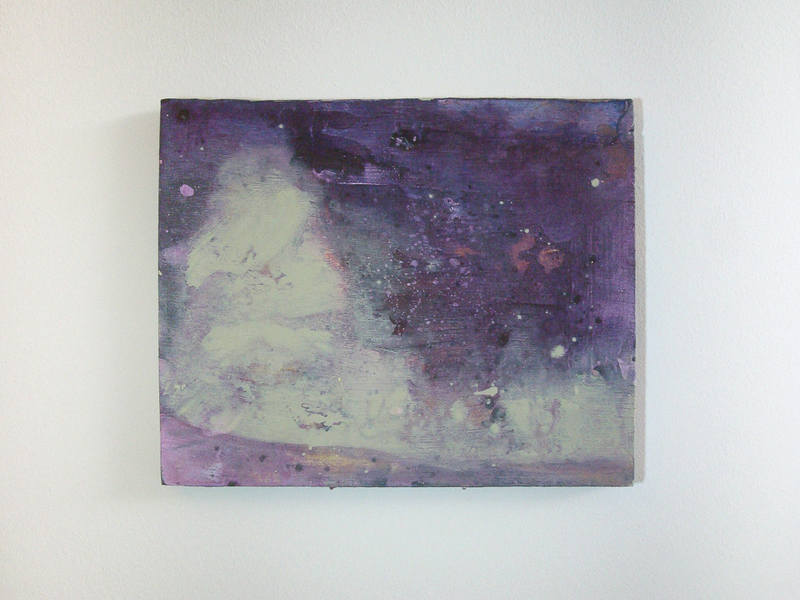 Lisa Denyer‘s paintings, once much more geometrical, these days approach diaphanous veils of carefully mixed colours, bursting into arrays of amorphous shapes, evoking landscape, and more often sky or space-scape, like miniature milky ways, . And the process of seeing them has similarities to the act of looking into the night sky and constructing images from constellations and clouds. 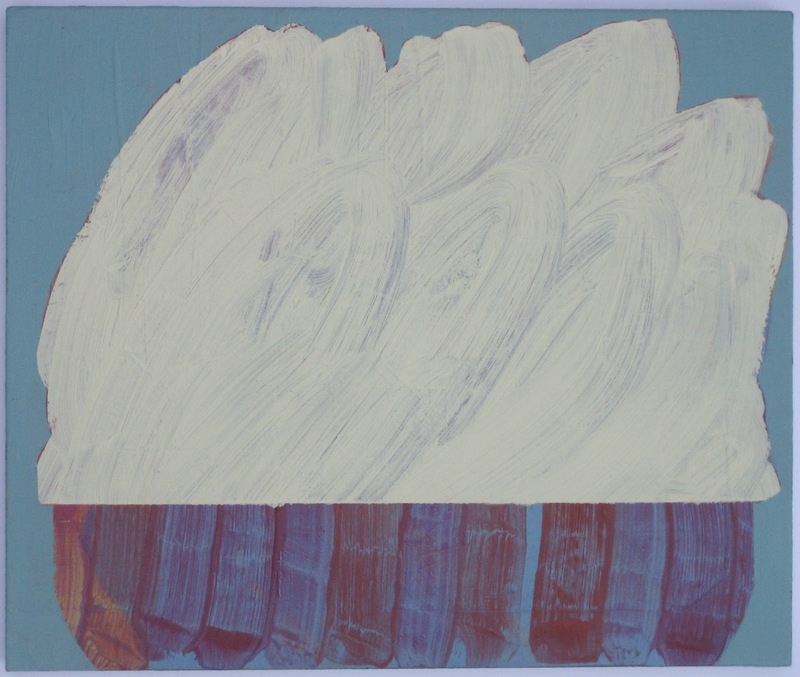 Lisa Denyer, Billow, 25x30cm. Image by courtesy of the artist. By now, I am used to seeing paintings by Matthew Macaulay propped up against a wall (at Meditations) or on a shelf (at Treatment) so it should be no surprise to see them here placed directly on the floor where there situation has to be taken into account when looking at them. In fact there is something vaguely humorous about their placing, so that although I shouldn’t be surprised I am, and I smile. That I get taken aback slightly seems right to me. In other arrangements of paintings by Macaulay interesting relationships between small paintings are set up, such that a novel way of organising separate images, becomes the art work. Arranging the paintings becomes drawing. 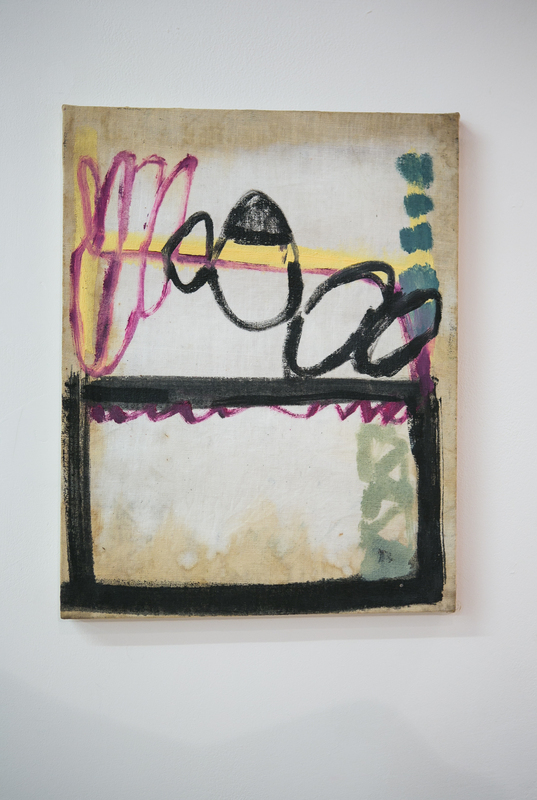 Here the relationship with the immediate context rather than with other paintings could be seen as part of the work. By far the most difficult wall to deal with in this exhibition is the one with the shiny insulating material and Macaulay dares to place a tiny painting of his against it, as if to challenge us to notice it. Next to it is probably the largest painting in the show that just about competes with that wall, a marvelous oil on canvas by Joe Packer entitled LizardDays, a tree-like image with barely anything happening in the ‘leaves’ and lots of painterly events crammed into the ‘trunk’ space. Daubs of contrasting colours appear to float in mid air, sometimes serenely and at other times frantically, beneath a vast green canopy. 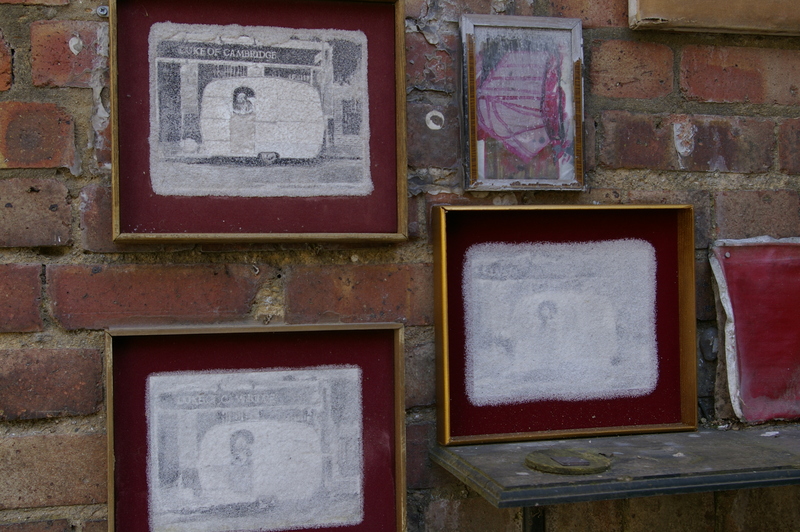 In front are three raised platforms, displaying over 20 small images on paper by Phoebe Mitchell. 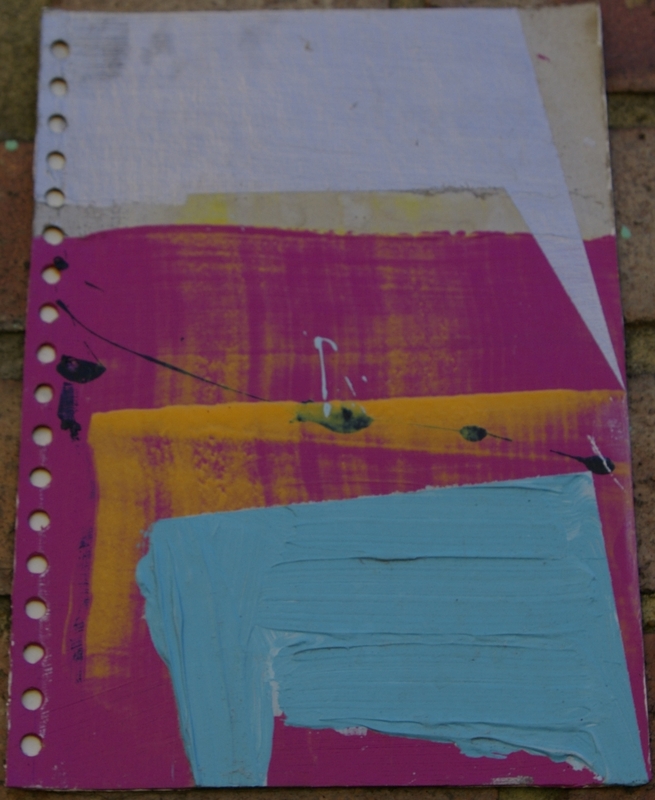 They form a delightful collection that functions as an artist’s book (I might have said ‘sketchbook’, except that they are much more refined than sketches), each individual piece worthy of prolonged viewing whilst also looking good as an arrangement. Melanie Russell‘s attractive new paintings are characteristically high in colour, with a synthetic quality, abstracted from “real life” observation (apparently, these have a relationship to power lines) they have become explorations of the kinds of spaces that hard edge bands of colour distributed over flat expanses of colour create. Lisa Denyer’s three dimensional painting on a piece of stone salvaged from a soon to be demolished building is perhaps the biggest surprise for me in this show. It is clearly painted from the outside, yet with little if any evidence of brush work, the colours look like they are pushed or stained into the surface. Enhancing the undulations of the existing form, I could imagine that the colours, rather than being applied, are drawn out from within. Its an old discarded stone, transformed, made precious, but also in another sense quite unchanged. In a domestic environment this and other of the forms in the exhibition, might function as decoration, (in my view a more worthy function than is often allowed), but not here. These forms don’t really adorn the space and make it more beautiful, they are too small for that, and the space too imposing, but they do make it more interesting, and seem to highlight aspects of the environment that I would quite literally have overlooked. The exhibition also poses questions about the what, the how and the why of painting, in other words about how abstract painting functions as well as what its function might be. 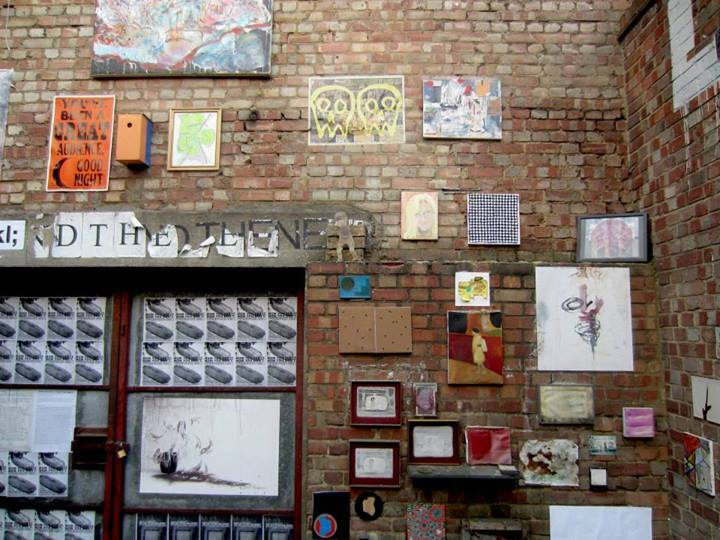 The new exhibition at the Lion and Lamb Gallery entitled Other Objects, curated by Caterina Lewis and Gwennan Thomas, includes paintings and objects by Karl Bielik, Alice Cretney, Vincent Hawkins, Caterina Lewis, Wendy McLean, Gwennan Thomas, and David Webb and is on show until 13 July. According to the gallery notes, the works, whilst coming from varied places of logic around abstraction, at some point in their realisation share a notion of object and placing them in proximity to other objects, persons or spaces, new relationships emerge inviting us to look again. For me “object” and “relationship” are key words in any consideration of abstract painting, even though they tend to get used in contradictory ways: in abstraction the object (content) gives way to relationship (form), or conversely the relationship (to content) gives way to the autonomous object (form). 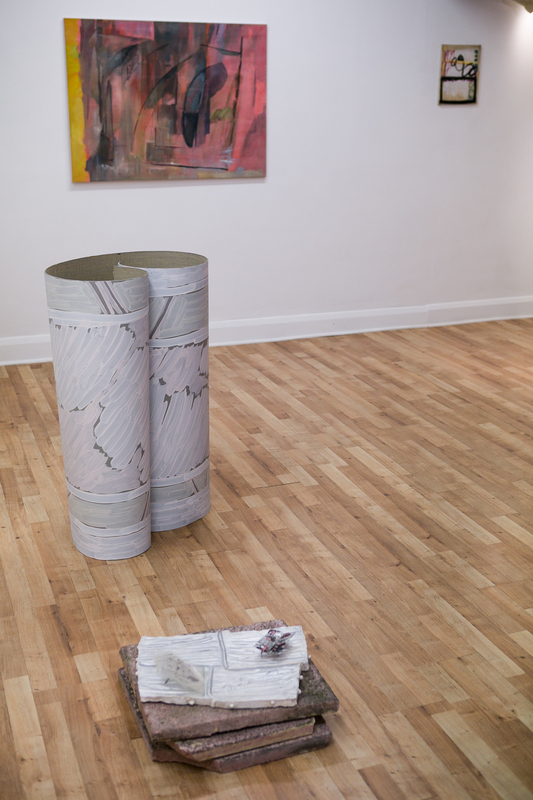 Foreground, Alice Cretney: installation, 2013. linoleum, acrylic paint, acetate, plaster, screws. dimensions variable. On wall: Wendy McLean: Wall, a foil, a distance, 2012, oil on cotton, 85 x 113 cm; and Karl Bielik: Widescreen, 2012, oil on linen, 35 x 27cm. Image by courtesy of Lion and Lamb Gallery. Stepping into the Lion and Lamb Gallery, in the back room of a London pub, and being a keen social dancer, I notice that the music being played in the pub, is a good jive tune, and letting slip my interest to Caterina Lewis, we reflect on the way that, in ballroom dancing, forms that were once derived from certain contents now operate independently of them. In Tango the hold, and head flick, may once have been related to the avoidance of the gaucho’s smell, or in old-time dancing the man placing his left hand firmly on his hip once had the purpose of keeping his sword out of the way. No longer wearing a sword, the male dancer continues to place his hand on his hip, the object has gone and only the relationship remains. 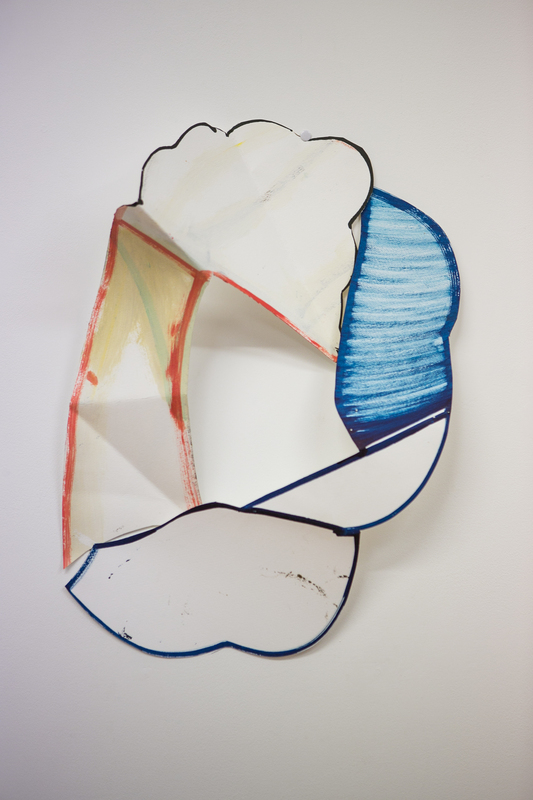 Alice Cretney’s sculptural ‘paintings’ are autonomous objects, their relationship to everyday objects is that they are ‘other’ in their “purposeless purposiveness” to borrow a phrase from Kant. The two-part installation here seems to offer two takes on painting’s rectangular picture plane, one that is three dimensional by virtue of being stacked and the other by being rolled. On the linoleum a set of painted gestural marks cannot compete with the one sweeping gesture of the roll itself, resulting in a curling ‘B’ motif drawn in space by the edge of the lino. 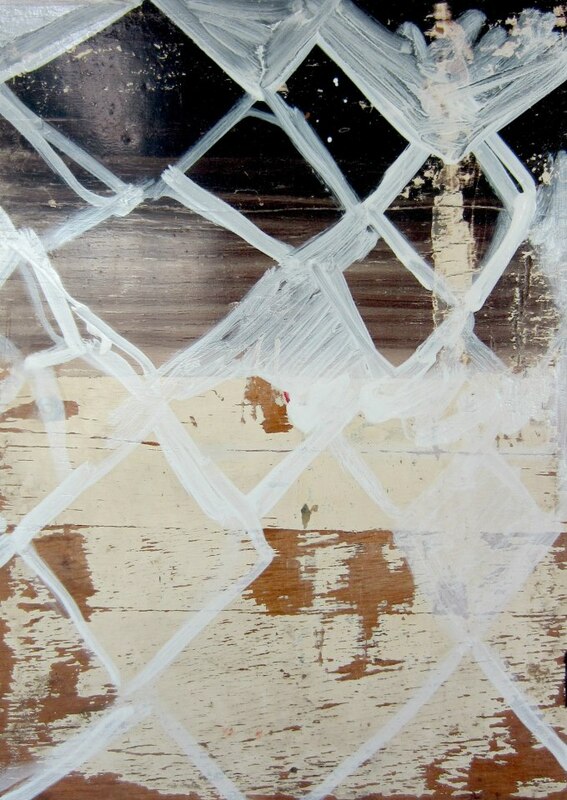 Behind it, the Wendy McLean painting, Wall, a foil, a distance, could be a picture of a graffitied wall, a painting of a painting, if it weren’t so immaterial, so veil-like, the marks that I thought were graffiti looking now more like vague objects in an undefined space, receding to a yellow stripe down the left hand edge, except that now the yellow springs forward to meet the surface. To make sense of it I compare it with other paintings in my head, and whilst the association doesn’t quite feel right because McLean’s space is less cubistic, it is Lyonel Feininger that keeps coming to mind, the way his architectural objects give way to light and space, so that in the end, that’s all there is. The light and space in Karl Bielik’s Widescreen, is interesting too. First of all there’s the literal, three dimensional space of the distressed, buckled object that appears to have been left outside overnight, or for a few nights perhaps! There is something quite beautiful about it as object alone, before ever considering the relationships within the non-literal space of the picture. Isn’t there a tradition in Japanese ceramics of damaging the vessel during its making in order for it not to be too “perfect”? 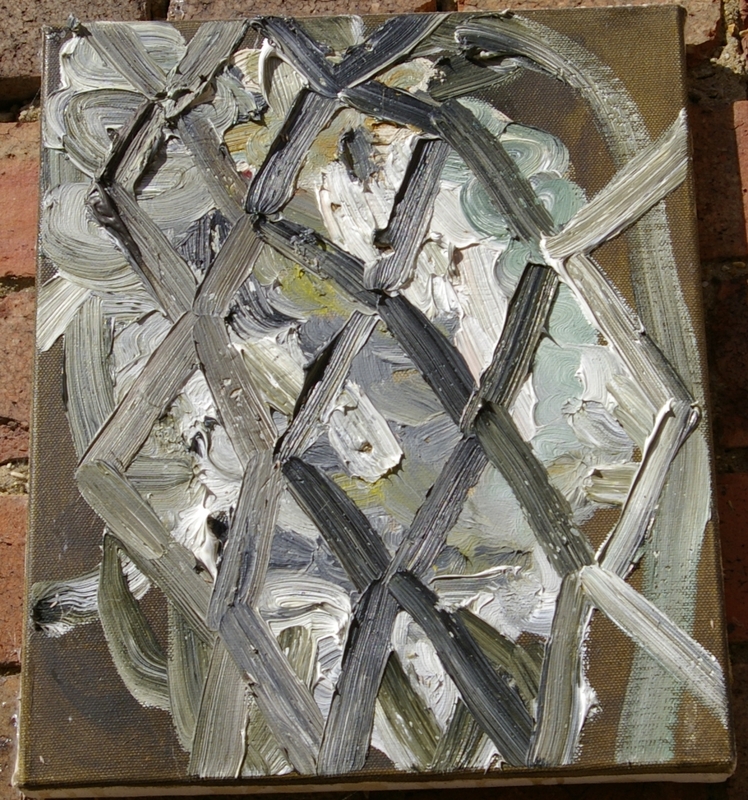 Turning my attention to the picture, I notice that white pigment, having been pushed into the canvas rather than painted upon it, reflects light back at me from within the painting, or from behind the group of drawn gestures that seem to dance across the top of a hard rectangle or box, possibly the ‘widescreen’ of the title. Above the centre line all is movement and lightness, whereas below it is stability and weight. But not quite solid. Taking my cue from the title, I imagine I am seeing objects on the top of a TV, light reflected back from a wall behind it but also generated from the TV screen below. Not that it is a representation of such a scene, but only that it is similar in structure, relationship again rather than objects. And thinking structurally, I am also tempted to speculate on other binary opposites suggested in the “above and below” of that centre line, oppositions like analogue above the line and digital below the line, or organic vs artificial, or unbound vs contained, but in doing so I become aware that so much of seeing is also interpreting, and that in observing I am also projecting, quite likely confusing facture and fiction. 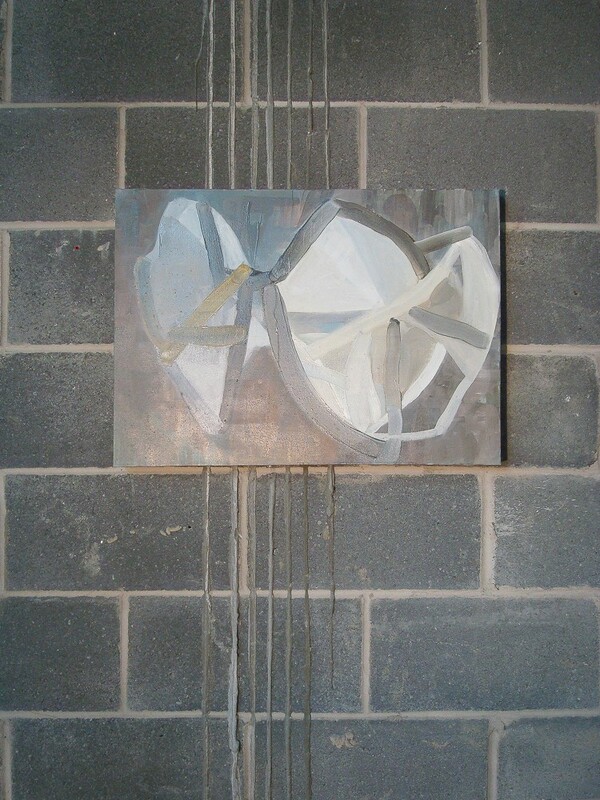 The other Karl Bielik object on show here, a painting entitled Net, is also capable of provoking allusions, whilst at the same time being strictly non-representational. Here paint, applied and removed, in an amazing variety of ways for such a modestly sized piece, collaborates with the viewer to construct a rich and interesting planar space that is somehow both coherent and ambiguous. Drips on the uppermost surface become structure in the ‘background’ as the free play of the painting process interacts with the free play of viewing in order to create a kind of meaning, there may be projected content (it is a stage, a face or a mask), personal meanings, but more fundamentally it’s this attempting to assign meaning that becomes the meaning of the work, relationship again as opposed to objects. Beilik’s pictures are dialogues, improvisations, having little idea at the beginning, of what the painting will become, he proceeds to lay down paint and then he responds to what happens, leading eventually to the crystallization of some image. Working on twenty or so paintings at any one time, he starts from the unknown and takes steps towards a constructed ‘known’, at some stage possibly writing a title, likely based on an association, on the wall beside one of the paintings being made. It’s all process: ‘how’ rather than ‘what’, relationship rather than objects of content. In the aesthetic reconstruction…naturalism is breached. The object falls apart. the boundaries are abolished. A field of untied relationships opens up: relationships between parts of the object and parts of the environment.. but also with parts of other objects. 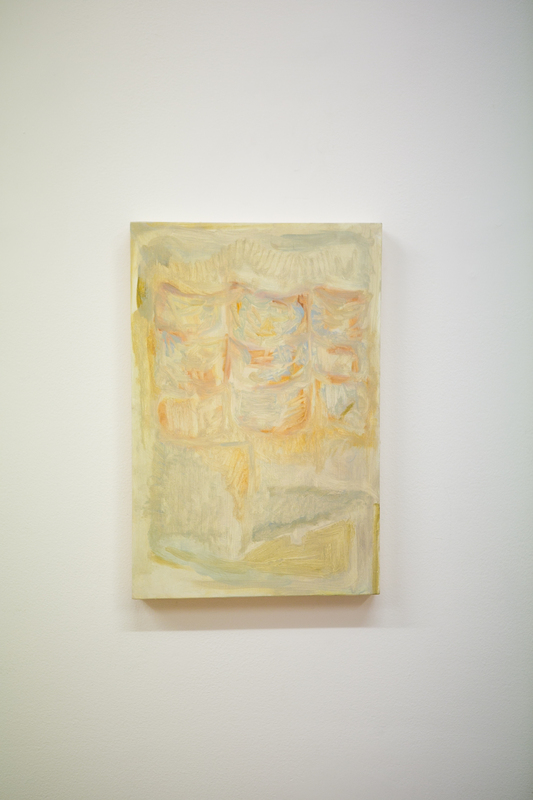 In Untitled (Yellow) Lewis seems to abolish the boundaries between objects as she wipes away previously applied paint, creating an absence, not so much ‘objects’ as an object, an exquisite surface. 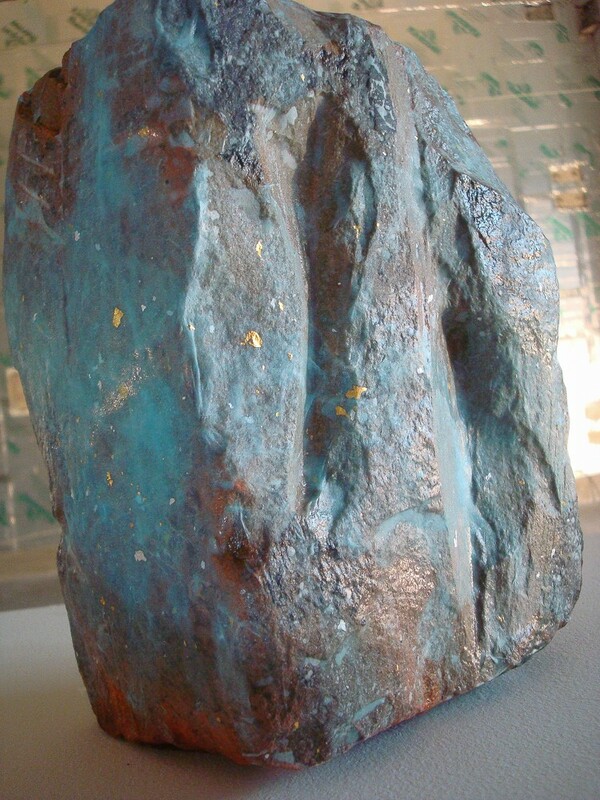 It is difficult not to see a head, possibly of a religious figure, especially as light seems to emanate halo-like from the ‘face’, but then it could also be read as a torso, or as an arid landscape, but these are mere vestiges of ‘objects’ that were her starting point ending up with a “field of untied relationships”. 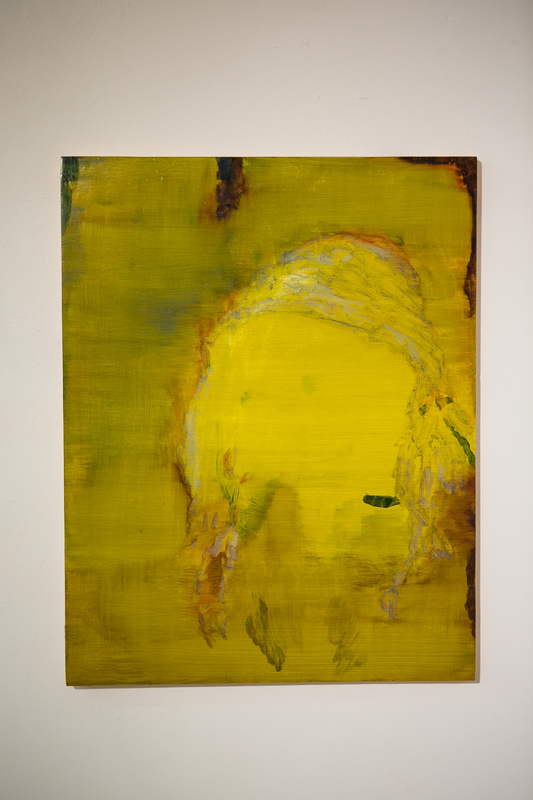 Her more recent painting Collar seems less glossy than Untitled (Yellow), a sketchy surface that to me looks like it is painted on canvas, though in fact it is panel. The drawing is delicate, her pictorial strategy being to use precision and accuracy in the service of the indefinite: fields of relationships again, rather than objects of content, yet the painting itself becoming autonomous object. 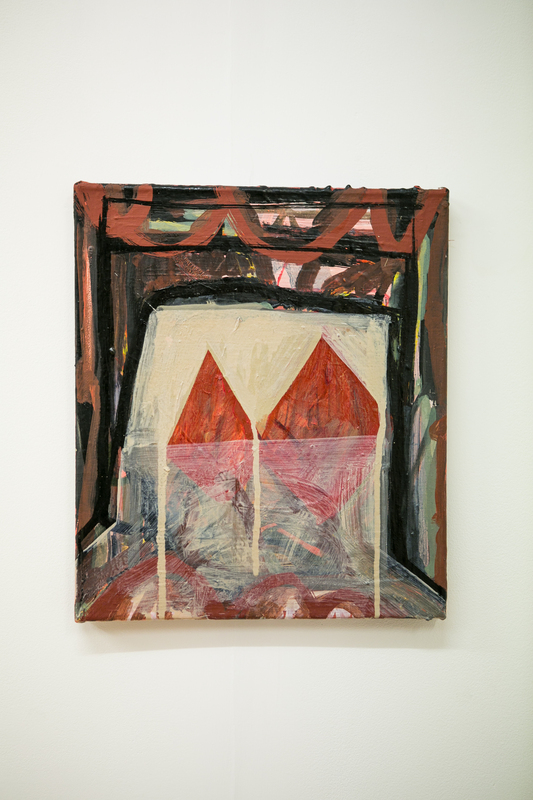 The Gwennan Thomas paintings have a vagueness about them too that I find fascinating, and I have a similar experience as with the Bielik paintings of trying to find meanings and resorting in the end to supplying my own, hence becoming aware of the meaning-making process rather than the ‘objects’ of meaning. 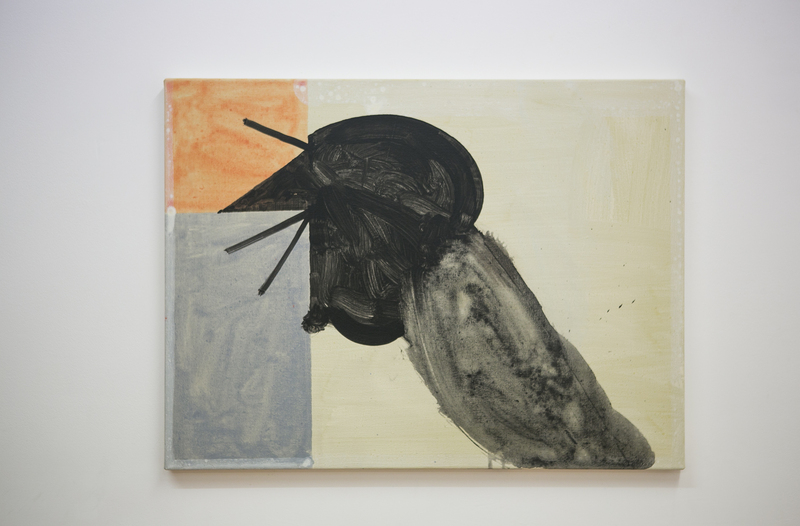 The oxymoron “precisely vague” seem to sum up the character of Untitled, 2012. The surface is the result of careful painting, and when I get up close I feel sure that the detailed modelling must dutifully represent something, but I can get no clue as to what it is. Possibly Greenberg’s definition of modernism: “the imitation of imitation as process” applies here. I find only few associations in David Webb’s Untitled (Tusker), where a somewhat threatening (elephantine?) grey figure takes up most of the space defined by two ‘screens’ one in front of the grey form and one behind. I am surprised that the orange of the far screen and the blue/grey of the near screen allows the space to be read as three dimensional, but it does, at least until the orange pushes forward to assert itself as figure after all and two black diagonal lines prevent the grey form from continuing to make sense as something journeying between two screens. 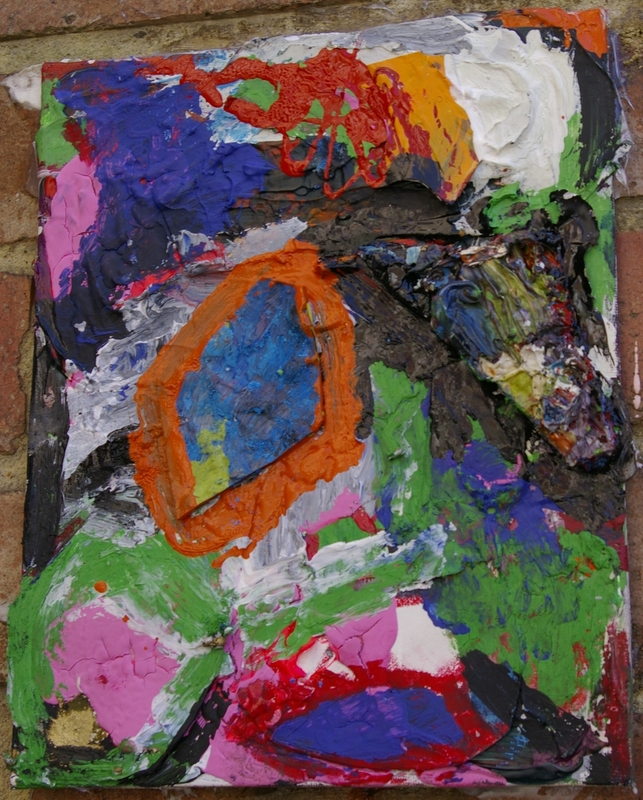 Now I am reading the shapes purely as shapes, the grey ones painted in two different ways the ‘body’ almost forming a pool of diluted paint in contrast to the heavier painted ‘head’ that is more opaque. The application of paint has produced a few minor splashes and there are small lighter painted marks towards the edges which aren’t so easy to see in a photograph (click to enlarge). They look like happy accidents at first but then I see them as carefully included, almost as if the painting has become a catalogue of painterly marks or relationships. 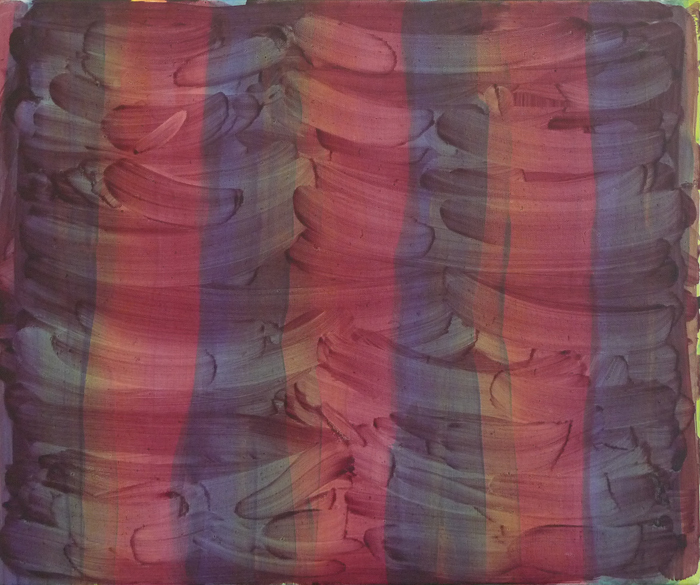 This painting is not flat, but it keeps becoming flat. It is a picture, but it sometimes makes more sense to think of it as a catalogue, or better an empirical investigation. There’s something of that in Vincent Hawkins works on card and paper. 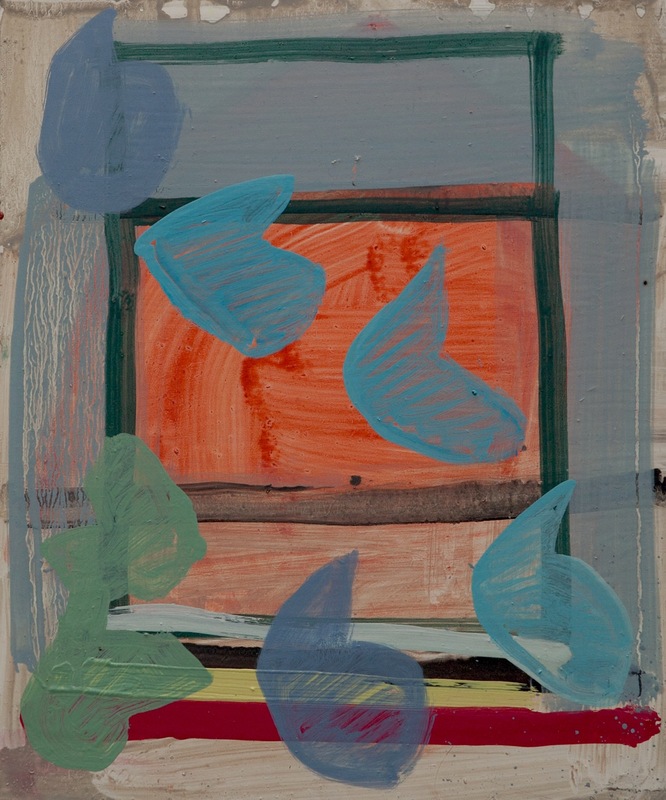 Whilst they are constructions, they do appear to contain some figural associations, for example in Untitled 2013, some of the shapes and colours bring to mind clouds and boats rendered in a somewhat cartoon style. 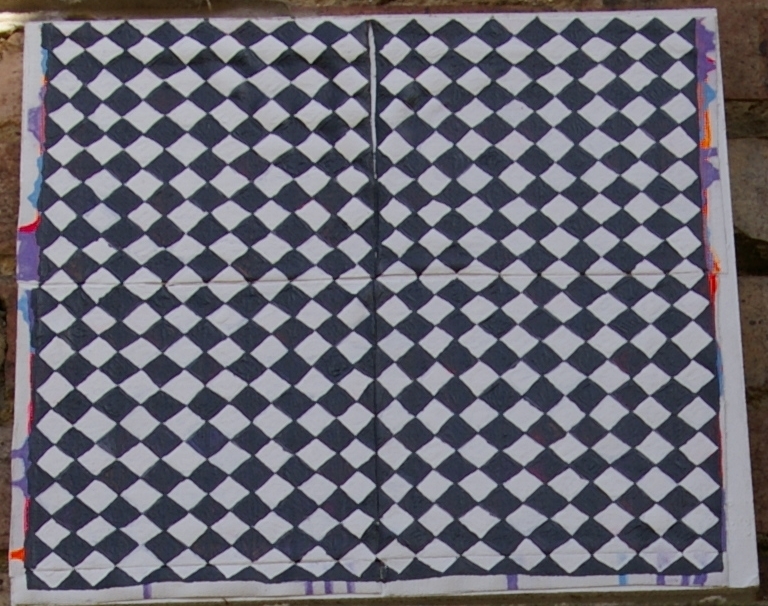 However, it is the careful folding of the paper to create a relief and the cutting out to create negative shapes that forms both their unique content and their objecthood. Like Cretney’s installation these abstractions are both painting and sculpture, or perhaps they are neither painting nor sculpture but other objects that, together with the other objects on show here invite us to look again and to think relationship over content. 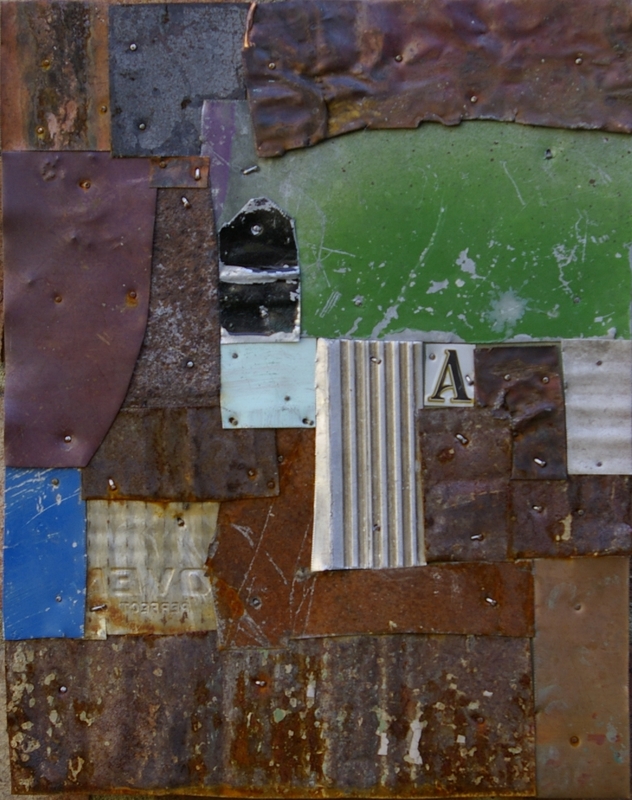 It could even be that such an invitation contains wisdom that reaches beyond the boundaries of the purely visual, the autonomous object, far from being hermetically sealed, maintaining a relatedness to other objects, to the world of the everyday. The Henk Engel quote is from “Theo van Doesburg & The Destruction of Architectural Theory” in Constructing a New World; Van Doesburg & The International Avant-Garde, 2009, London, Tate Publishing, p38. The Clement Greenberg quote is from “Modernist Painting”, in The Collected Essays and Criticism, vol. 4, Modernism with a Vengeance, 1957-1969, ed. John O’Brian (Chicago: University of Chicago Press, 1986), p17. 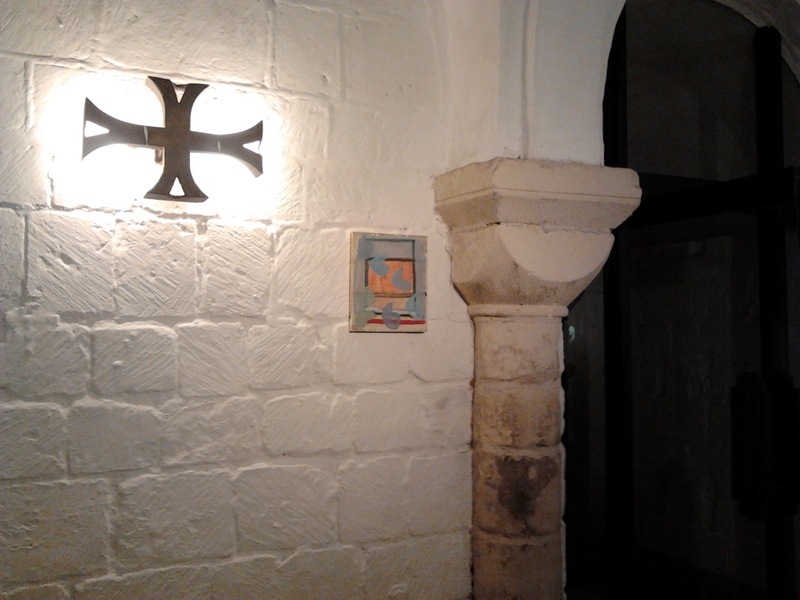 There’s nothing plain about Plane Space, an exhibition of abstract paintings, at Worcester Cathedral Crypt, 8 – 15 September 2012, curated by Dan Roach, artist in residence there. 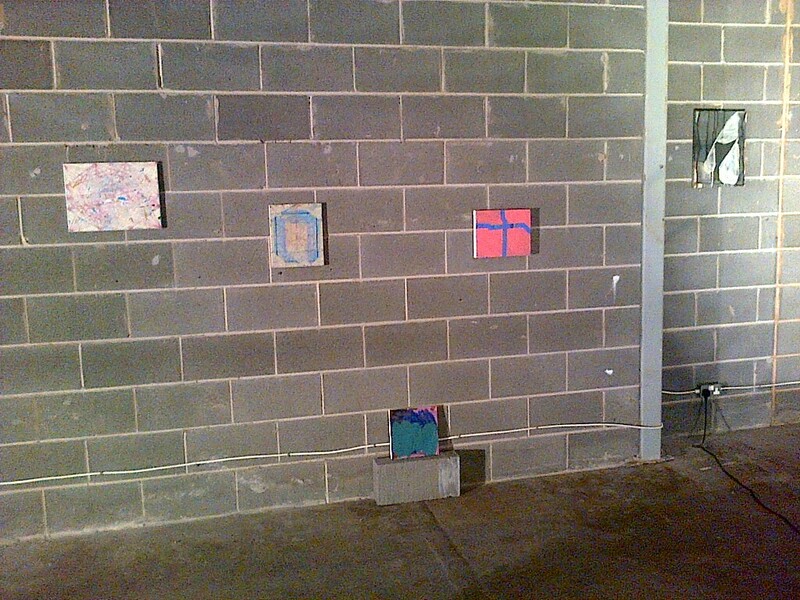 The show includes paintings by Karl Bielik, Katrina Blannin, Sarah McNulty, Dan Roach, Paul Rosenbloom and Gwennan Thomas, scattered throughout the crypt, rather than ‘hung’, I guess partially because of the limitations of using such a poetic space (I would be amazed if you were allowed to drive screws into the ancient wall). 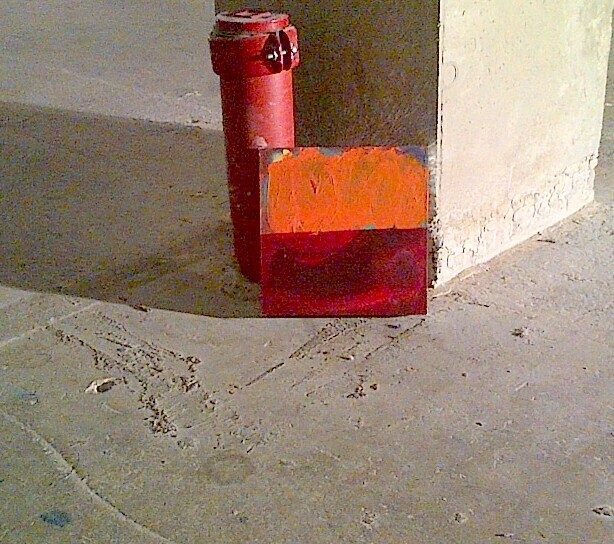 I had no idea when I visited that as well as negotiating the planar space of the abstract paintings on show, those paintings themselves would also be influencing me to explore the anything but plain space of the Cathedral Crypt, in a manner not unlike ‘hunt the thimble’. Nearly every church building I have seen today has an ‘Open’ sign outside it. 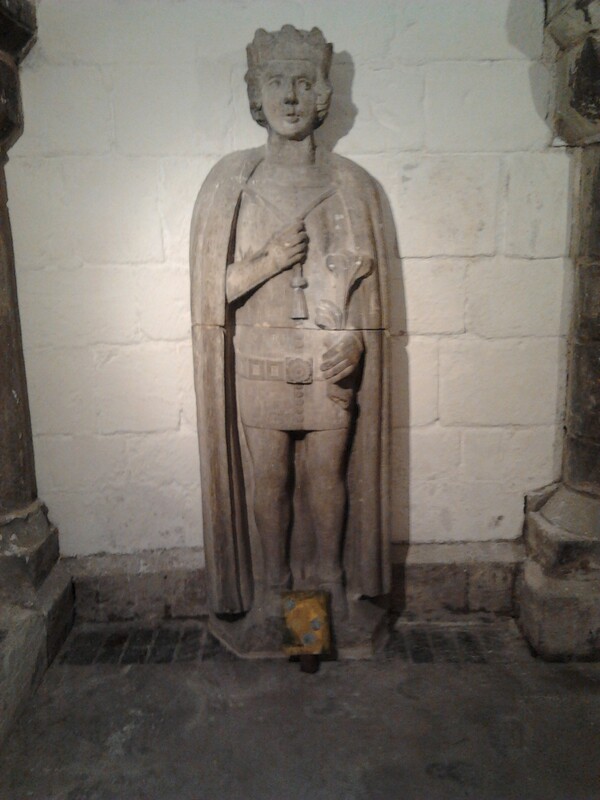 Worcester Cathedral is no exception, and there are numerous visitors to the crypt who had no expectation of seeing paintings here. On entering, they look slightly confused, as if to ask (without actually asking anyone) “what are these people looking at?” Their experience may have been in the opposite direction to my own. I came to view paintings and they seemed to lead me to the space, they came for the space and it presented them with the paintings. Like the tiny Dan Roach situated at the foot of a statue. When I posted previously about a Dan Roach painting, Zak Braiterman made the observation that my write-up sounded to him like a description of religion, something to do with clearing away of layers and gestural marks on the ritual surface . I am not sure I quite get it, yet it’s strange now to be seeing Roach paintings in this religious setting. And there is something of a ritual quality to his production, repeating his now familiar hexagonal motif, as if attempting to understand it rather than just to ‘use’ it, or as if the act of painting is a process of learning, of coming to know something that may already be known by others but for the learner is known for the first time, a revelation. 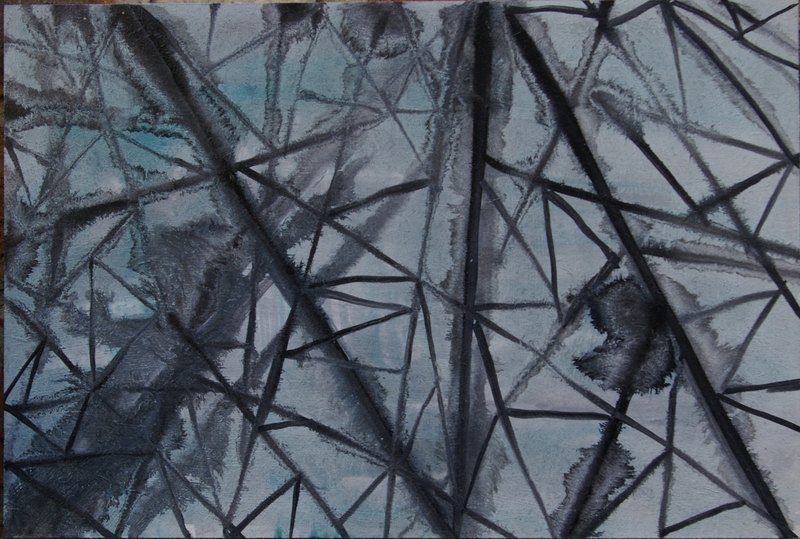 In this painting the hexagonal motifs float in a space that I cannot help but see as deeper than the two-dimensional flat plane that I know it is and that the painting itself keeps reminding me it is, by the refusal to open up a window on the world of recognizable objects, almost as if I find myself at the moment where perception attempts to become cognition and the attempt is continually thwarted. Maybe that moment (which, following John Grinder and Judith DeLozier, I think of as similar to the state that Carlos Castaneda referred to as “stopping the world”) holds information for us, and abstract painting allows us to remain there for longer than we usually do. Those organic hexagons could settle, they could join in network-like formation, yet they remain perpetually frozen in that space-time moment of being just about to form. Katrina Blannin’s marvelous paintings here look fully formed, yet in each one there is also a shifting, just when you think you’ve ‘got it’ the forms or gestalts shift and you notice a different reading, and then another, and another. 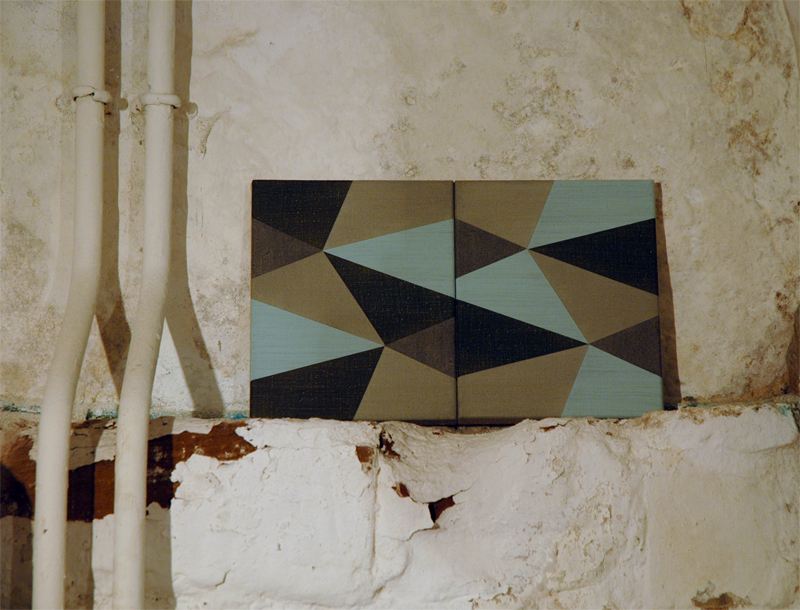 Even the fact that we so clearly have a series: diptychs exploring the same arrangement of triangles and rectangles in different colours, that change things remarkably, reminds me of the unfixedness of fixed things, or that within a rational order is infinite variety. I like seeing two of them here, and I hope for an occasion to see the whole series together. On seeing the first one, even in this small space, separated far enough from the other as to be unaware of its presence, my reaction is to wonder if it is the same one I had seen recently at the Double Vision exhibition at the Lion and Lamb Gallery. Even though I know it is not the same, the colours are different, I consider it possible that I am mis-remembering it. 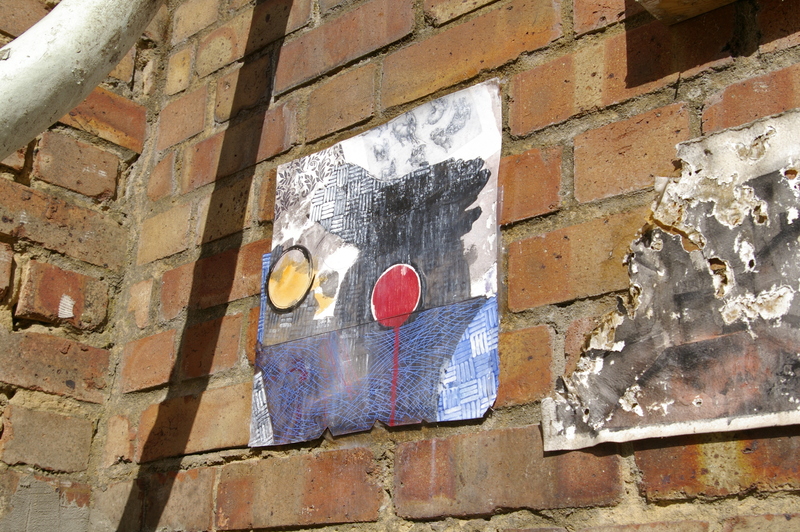 On seeing the second diptych here, I realise that both these two are different to the one I saw a few weeks previously. I am an identical twin and when my brother and I are apart we often get mistaken for one another, which could not happen when we are together. I think these paintings are like that. 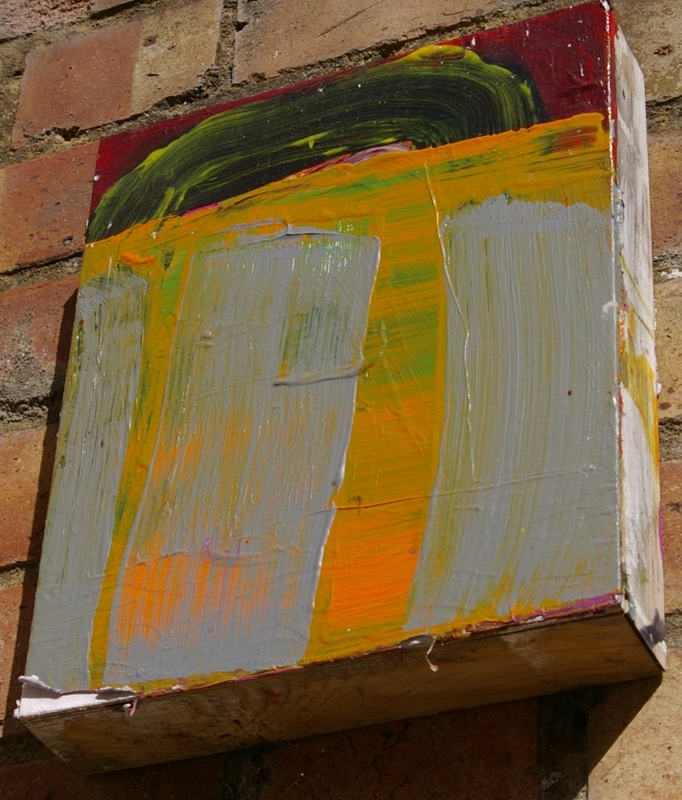 In a similar way to the series reminding me that this one work is also a part of a larger whole, a system, this particular ‘hang’ sets up clear connections with the surroundings so that it is not just each painting that I am viewing but its relationship to a wider context. It would be difficult not to notice the beauty in the contrast between the copper colours in the wall and the blues in Blannin’s Hexad painting. 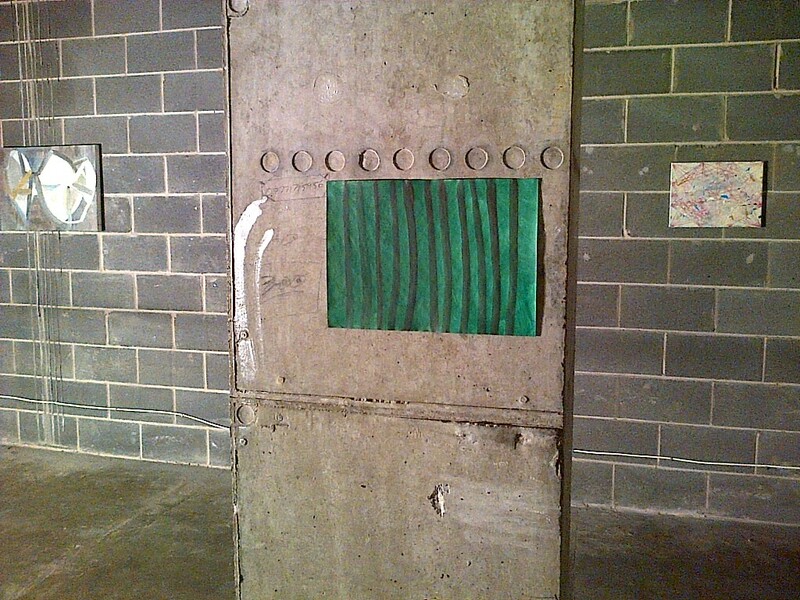 Similarly, the Sarah McNulty painting M (II), cannot not be connected to the environment when it is already placed on concrete before then being placed here in this space. 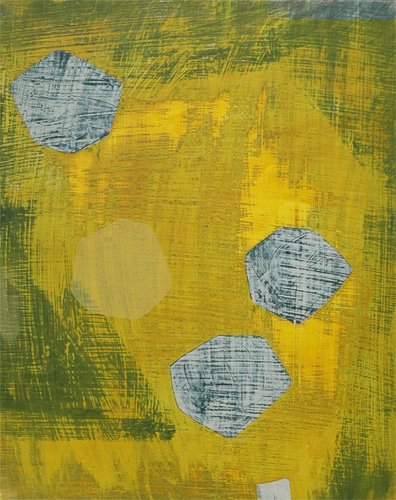 Other paintings here sometimes have a pebble or a piece of wood perhaps, discretely placed beneath them to keep them straight, but these are not part of the painting whereas in the McNulty the medium is “Gouache on Linen on Concrete”. 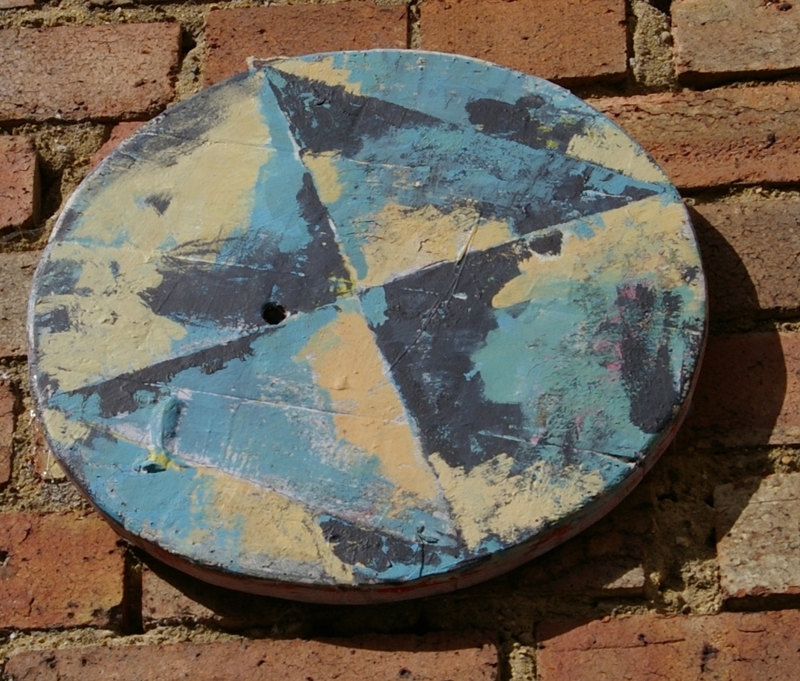 The relationship between art work and plinth sounds like a concern more associated with sculpture. The object-ness of an abstract painting also brings this consideration to mind in painting and being in this space seems to emphasise that. The painting Apostrophe by Karl Beilik seems to assert that abstract painting can evoke places and events, and that a motif might be borrowed from everyday text, yet in such a way that is ambiguous, are they “really” apostrophes or do they just look a bit like them? 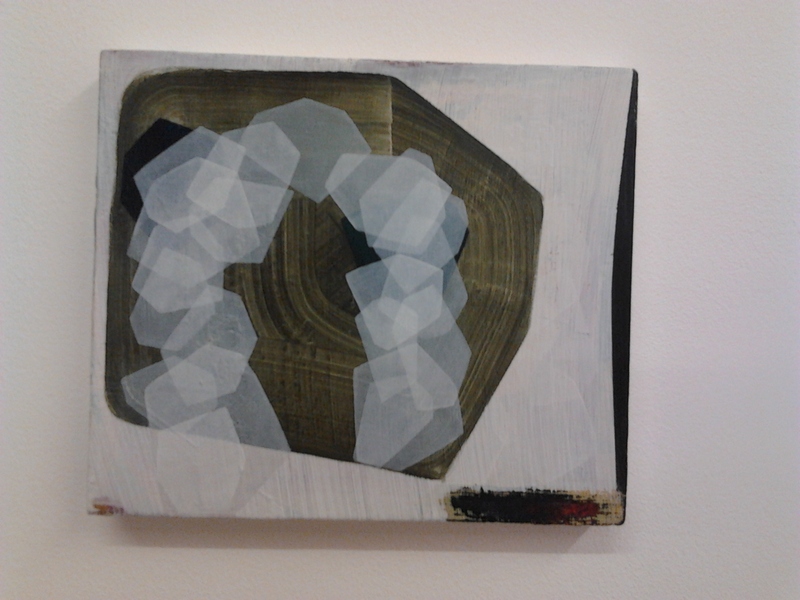 Gwennan Thomas’s paintings are similarly ambiguous: forms that don’t quite form, bringing my attention to the way objects are formed or coded, before ever considering what they might mean. The Paul Rosenblooms resemble cave paintings, marks etched into painted grounds, gestures and ritual again maybe, invoking a past much older even than Worcester Cathedral’s Norman origins, or of abstraction’s barely 100-year-old history. 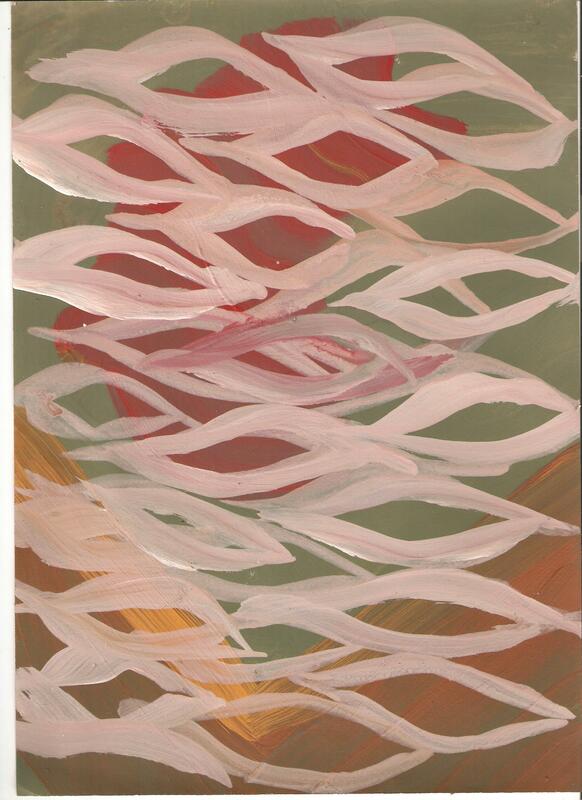 On viewing these abstract paintings at Plane Space, I could easily begin to speculate on the status of abstract painting in contemporary art, for some already consigned to the crypt, painting being dead and abstract painting especially so, quite possibly in danger of becoming a mere footnote in its ancient history. 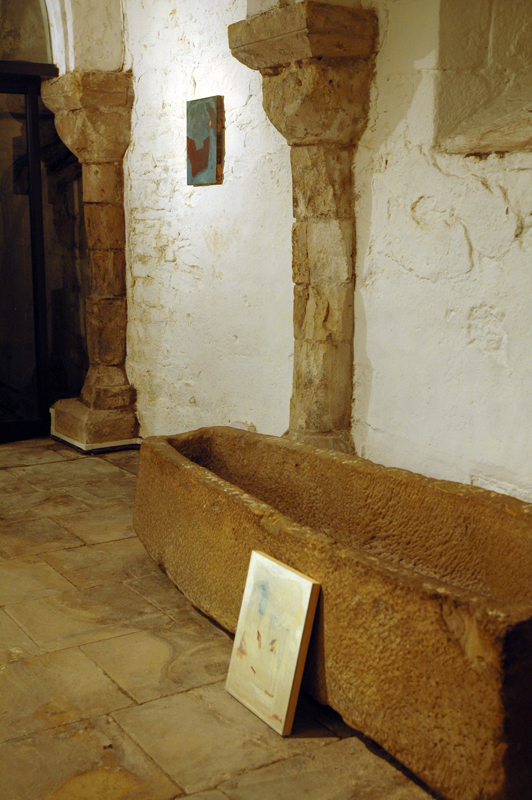 Here in this crypt however, it seems very much alive, demonstrating its power to evoke and reveal, not so much the visual world outside it as the very coding of the visual. 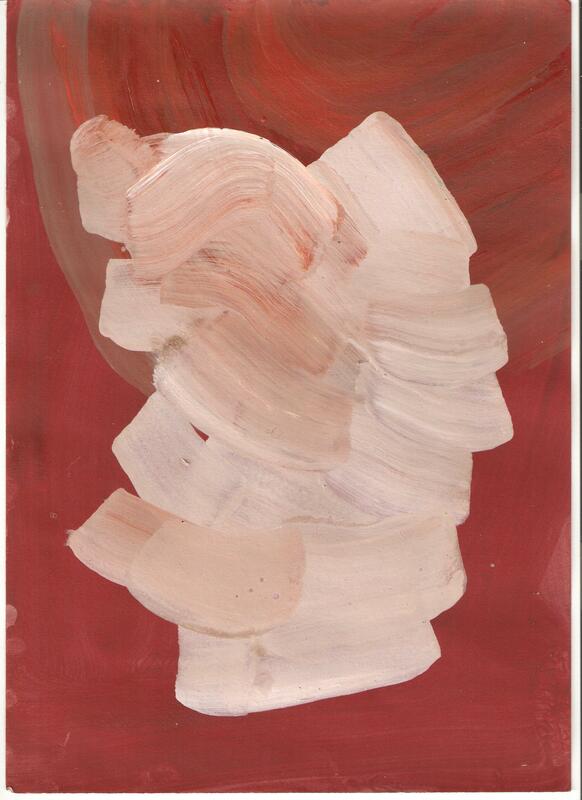 …beautifully painted, the way that various layers show through carefully rendered transparent shapes, themselves forming a rhythm that echoes the central figure, and contrasting with other shapes that are also made by revealing underpainted areas but this time as if clearing away the top layer to allow a gestural mark to come right up to the surface. I am glad that David Manley recently brought my attention to another opportunity to see work by Dan Roach at the upcoming Plane Space exhibition in Worcester Cathedral from 8 to 15 September. 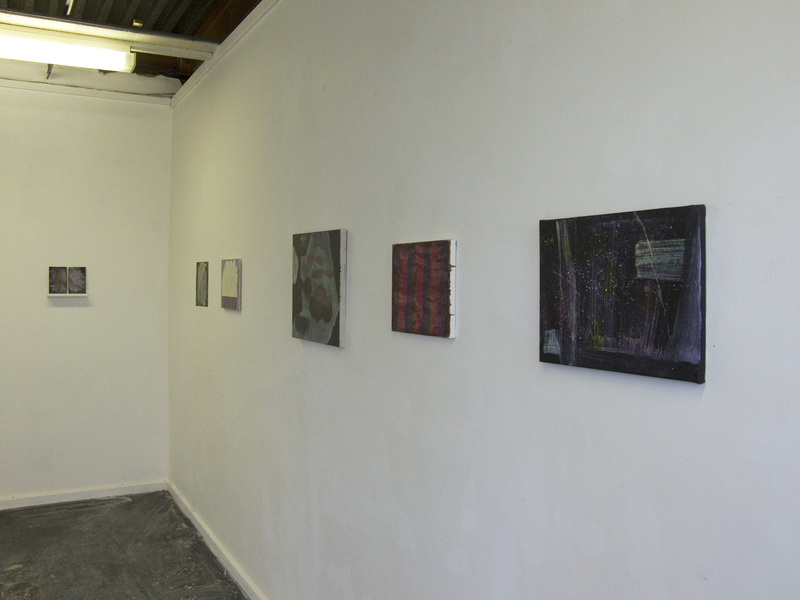 It also includes, Katrina Blannin and Sarah McNulty (they also showed work at Double Vision) as well as Paul Rosenbloom, Gwennan Thomas and Karl Bielik. Thinking of Bielik there’s this good write-up of a studio visit by Paul Bhenke at Structure and Imagery.